The nineteenth century saw the emergence both of history as an independent scientific discipline and of national history as a means to legitimize the nation state. 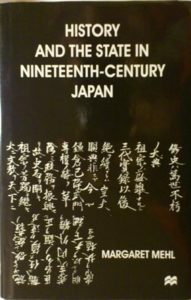 In History and the State in Nineteenth-Century Japan Margaret Mehl examines how the new imperial government, which replaced the rule of the shoguns in 1868, made the compilation of an official national history part of its nation-building project. An imperial rescript decreed that a government office of historiography be established in order to resume the ancient tradition of compiling dynastic history. Shaping the modern nation, however, involved re-shaping ways of representing the past. The office moved to Japan’s first modern University in 1888, where it was transformed into a research institute, known today as the Historiographical Institute at the University of Tokyo. The former government officials led the way in establishing history as an independent academic discipline. 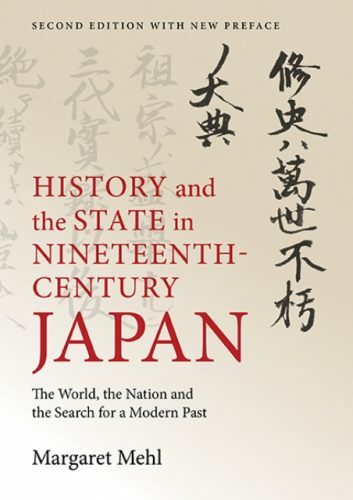 History and the State in Nineteenth-Century Japan shows how the government’s efforts to legitimate the emperor-centred nation state, indigenous traditions of scholarship and impulses from the West combined to shape the modern discipline of history in Japan. The relationship between history and political ideology, German influence and the importance of history for national identity receive particular attention. Modern historical scholarship in Japan did not merely follow Western examples. Rather, it emerged almost at the same time as in Germany and other Western nations as they all faced similar global challenges. In a new preface the author reflects on the way the writing of History and the State in Nineteenth-Century Japan was influenced by the circumstances under which she worked and on the perils of privileging national history in an increasingly globalized world. First Edition: Basingstoke and London: Macmillan, 1998. Rekishi to Kokka: 19 Seiki no Nashonaru Aidentiti to Gakumon. 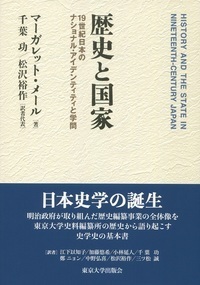 [History and the State: National Identity and Scholarship in the Nineteenth Century] Translated by Isao Chiba, Yûsaku Matsuzawa, Nyung Chung, Ichiko Eshita, Yûki Katô, Noboru Kobayashi, Makoto Mitsumatsu and Hiroki Nakano. Tokyo: Tôkyô Daigaku Shuppankai, 2017.